In the Ultimate Guides introduction we discussed how to identify your geek, and now it’s time to get to the fun part; shopping! 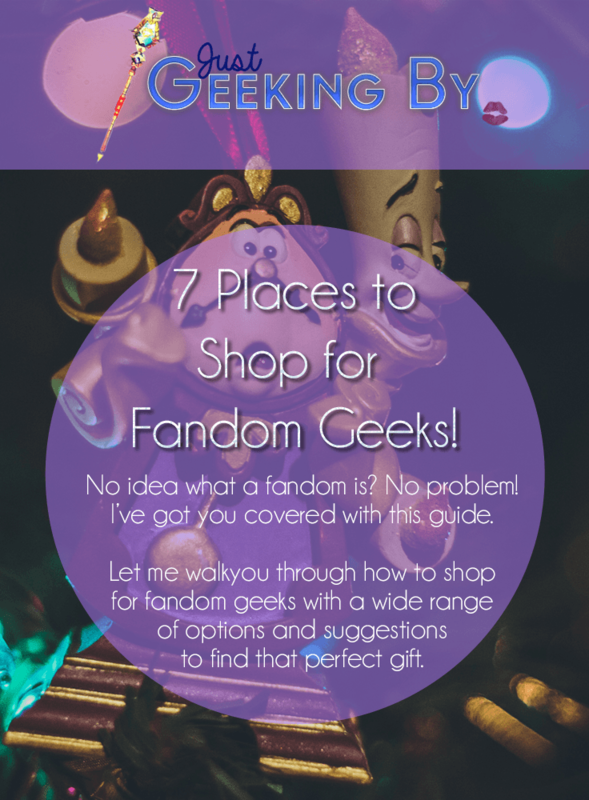 This aim of this guide is to introduce you to a variety of online stores that offer some fantastic products for fandom geeks. I’ll be highlighting some of my favourite products and I’ll also be providing you with links to some additional gift guides for geeks. By the end of this article you will be confidently armed with a wealth of information to go forth and buy an amazing present for the geek in your life! In your investigating you hopefully discovered which fandom/s your geek is interested in. Maybe they’re a huge Star Wars fan, or they love Marvel comics? If you didn’t then don’t panic because I’ll be covering some generic gift options too. If you found out that your geek is a video game or fan of a book series, such as Harry Potter, then I’ll be covering those in separate guides in a few days. 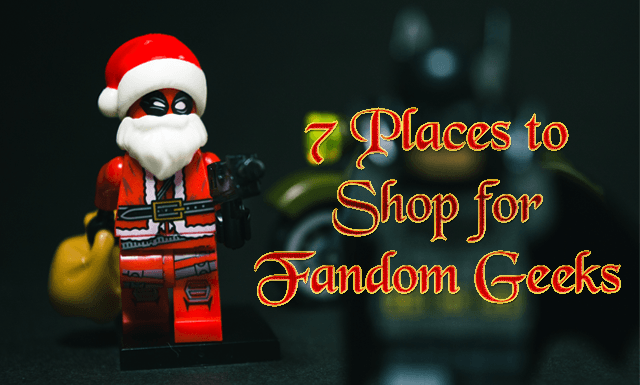 In this guide you’ll find gift ideas for fans of; movies, TV shows, comics and graphic novels, anime and manga (Japanese comic books and graphic novels). Handmade gifts are not only an amazing, and beautiful way to show someone you care for them, they’re also unique. In the geeky world handmade items are especially precious to us because they are created by fellow fans who share the same passion we do. It is very hard to find geeky items in stores sometimes and that means there is a thriving market for handmade geeky products online. 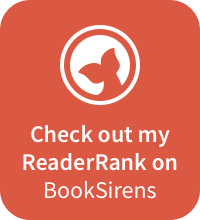 I could dedicate an entire series of guides just to what is available on some of these sites so I have chosen instead to provide a list of sites and let you browse them at your own discretion. Etsy is handmade heaven and you may find yourself losing several hours browsing there, so if you’re short on time go in with a plan. You can find literally everything there including things you haven’t even considered. It is also an international site so you have access to creators from all over the globe. Another great handmade site that has a vast range of handmade goods for sale by creators. Folksy is the British etsy, so to speak; it’s described as the “the home of British craft”. They have some fantastic items available that you probably won’t find anywhere else. Similar to handmade gifts are online stores where artists sell prints of their artwork and designs. These unique designs can then be bought as prints, stickers or printed on a range of products such as t-shirts, notebooks and even clocks! This can lead to you finding the quirky gift for just the right person. Products designed by independent artists that are then printed and manufactured on quality products. Each artist decides which products they want their design featured on, so not every design can be placed on a mug, for example. The variety of products, especially when it comes to clothing, makes this a great option for gifts as there is something for everyone’s style. If you’re looking for quality design and fine art then Society6 is the place to go. There’s graceful typography, detailed art depicting characters and everything in between – and they’re available on every product imaginable. There’s apparel, furniture, home decor, art prints, stationery and my personal favourite – bags. Finding decent geeky bags isn’t easy and here is an entire site full of beautiful designs. As the name suggests Teefury focuses on apparel, namely t-shirts, tank tops and hoodies. They have a wide range of designs created by individual designers, which they’ve also grouped into specific collections to help you find exactly what you’re looking for – something really useful for gift hunting! Qwertee has a different than the other sites on this list. Designs are only up for a limited time so you have to be quick to get your hands on the ones you want. The great thing about this is that it means there’s always something new and fresh, and you get some incredible designs. It is a t-shirt only site catering for adults. A subscription box is a box of products that gets delivered each month, and you can choose to sign up for a subscription for 1 month, 3 months or more. Subscription boxes make fantastic gifts for geeks because they include a range of different products, often exclusive ones for a great price. Most boxes offer a variety of products so these are idea if you’re not sure what fandoms your geek likes. You can either choose to order an actual box or buy them a subscription/gift card which they can then choose to use when they wish. My Geek Box UK – This amazing Geek Box site doesn’t just have one subscription box available; it has three! They have the usual general geeky box that changes theme each month, a special box with a set theme and now a new dedicated Rick and Morty quarterly box. Loot Crate – The International Loot Crate and probably one of the most well know, Loot Crate has over 25 options available now. There is something for everyone. KawaiiBox – Kawaii literally means ‘cute’ in Japanese and that is what these boxes are filled to the brim with; cute Japanese products. WootBox – Another site that offers a geeky subscription service as well as speciality one off boxes in their shop. Geek Gear – A UK Geek box service which has a geeky products box and a wearables box available. Popinabox – A subscription box service dedicated to Funko Pops which are a popular collectable for a lot of fandom geeks. ZBox – ZBoz is a subscriptin box offered by the UK store Zavvi and offers a standar box, special boxes and a ‘Threads’ box which is a box consisting of a book/comic book and a t-shirt. Monthly Tee Club – Exactly what it says on the box; a monthly subscription box for geeky t-shirts. Subscribers can choose between 1 t-shirts, (Kit) 2 (Kaboodle) or 4 (Kit and Kaboodle). There’s also the option of official merchandise and a hoodie. This list is a mixture of UK and US stores. Probably the biggest UK online store for geeky products, EMP has some fantastic items especially for women when it comes to fashion. There’s TV Shows such as Game of Thrones and Stranger Things, Movies like Star Wars and Jurassic Park and of course Marvel and DC comics. One of my personal favourites is this I am Groot T-shirt from the Marvel selection available. They have a brilliant range of items for Disney fans, and I especially love this Beauty & the Beast rose hair charm which is absolutely exquisite. EMP is the UK equivalent to Hot Topic and it usually gets a lot of their exclusive items, such as Funko Pops. Hot Topic is one of the most well known places to go to for pop culture and geeky fashion. It has a wide selection and also has a great plus size selection for women. Truffle Shuffle is home to retro clothing and gifts, and it’s the place to go for 80s and 90s clothing and gifts. As well as being a subscription box service, My Geek Box has a great shop filled with geeky products. They also have some fantstic offers right now including two geeky tees for £20 and 2 Dorbz figures for £12.99! You might be familiar with Zavvi already if you’re in the UK. They replaced the once famous Virgin Megastores which could be found in every city, and now are pretty much just online. They’re still a great place to find TV and movie merchandise. 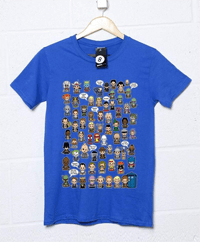 A UK based apparel site which specialises in geeky t-shirts and sweats, 8Ball is infused with a passion for all things geeky. It’s sewed and drawn into each design, and I could see it as I browsed the site. As an 80s kid I absolutely love the ‘What I did in the 80s’ t-shirt. 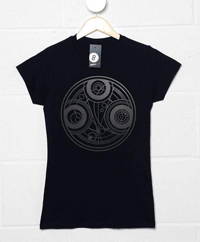 Then there’s this gorgeous Doctor Who inspired Timelord design that has several other designs, including one in the shape of the female icon to celebrate the 13th Doctor. They also offer custom gifts, T-shirts with your own choice of texts using the designs and typography from famous movies and TV shows such as Flash Gordon or Back to the Future. Forbidden Planet is a chain of stores in the UK which specialise in geeky products with a focus on comics, graphic novels, manga and books.They also have a great selection of collectables as well. Now comes the confusing part; there are two separate companies that operate in the UK and only one of them now trades online. FP.com is the one that operates in England, while the now closed FP.co.uk operates only offline in stores in England, Ireland and Scotland. The good news is that you can still visit either companies stores to buy gifts, however, this site is only linked to the stores in England. Think Geek is aptly named because if you can think of somethink geeky they most likely have it and then some. Like this animated Porg which was accompanied by me crying out ‘OH MY GOD an animated PORG!’ several times in awe and amazement. 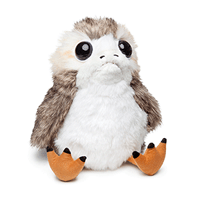 If you know a Star Wars fan who loved Porgs; GET THEM THIS. They will love you forever. 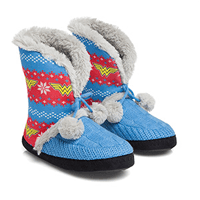 I’m also in love with these Wonder Woman Knit Bootie Slippers for Wonder Woman fans. I love the Christmassy kit design on them. Superhero Stuff is a fantastic site dedicated to superheroes from Marvel and DC comics as well as heroes from pop culture giants such as Star Wars, Game of Thrones, Transformers and many more. What I like best about it is that it allows you to browse by hero which makes it great for picking out a gift for someone who’s a fan of a specific character. A UK store that tends to lean more towards the alternative and gothic, Grindstore also has a large amount of Geeky products available too. It tends to be more male friendly in terms of geeky fashion though with most of it’s female fashion being goth or alternative. It does have a nice selection of anime gifts though and it’s gift section boasts an impressive section of ideas, including under £5 and under £10 sections which are perfect for that work secret santa or stocking fillers. Star Wars “Fanmade” Christmas Gift Guide – Remember all those handmade sites I introduced you to? Jenmarie of Anakin and his Angel has rounded up a selection of her favourite handmade Star Wars items made by fans. And the best bit? They all are just $10 & under! Fit Geek Gift Guides 2018 – The idea that geeks are lazy and unhealthy is well out of date and let Ray of Superpowers Sold Separately show you what gifts you can buy for your fitness loving geek. She covers Harry Potter, Marvel, DC Comics and Star Wars in this great guide to geeky fitness items. 35 Deadpool Gifts – The Ultimate Deadpool Gift Guide – The second Deadpool movie may have graced our screens this year, however, if you’ve got a Deadpool fan to buy for they’ve probably been a fan for a while. This ultimate guide by Chantal of Nerdy Mamma incorporates products from the films and the comics so you’re sure to find something awesome for any Deadpool fan. 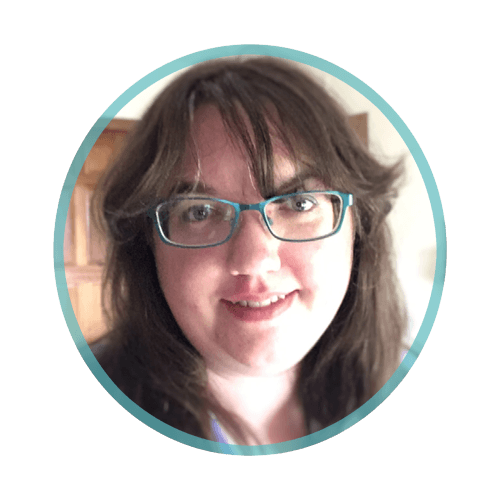 The Ultimate Gift Guide for Geeks – Michelle at a Geek Girl’s Guide takes you through every type of geek imaginable and a wide range of perfect gifts for each one. The Ultimate Geeky Princess Gift Guide – From Amanda and Melissa of The Geeky Fashionista this fabulous guide is filled to the brim with everything you need to make dreams come true for a Disney fan in your life. Dr. Who Gifts for Fans of the Doctor – Doctor Who is one of those fandoms that has touched many generations and this guide by Chantal of Nerdy Mamma touches on each generation of the Doctor, so whether you’re buying for a fan of the original series or the new adventures this guide has something to offer. 15 Personalized Gifts For Marvel Fans – If you’ve never heard of Zazzle before it’s a site that lets users upload images and create personalise items. They can also choose to sell designs to others too, and Kathy of Krysanthe has rounded up her pick of the best Marvel products Zazzle has to offer. She’s also included some great tips on how to customise them to add the perfect personalised touch to finish off the gift, and as she’s a crafty genius she knows what she’s talking about! 20 + Funko Pop Gifts for Collectors – I’ve mentioned Funko Pops multiple times in this guide, but there’s literally hundreds of them out there now. How do you decide which one to get? Chantal of Nerdy Mamma has you covered with this great guide. Incredibles 2 Gift Guide – Super Gifts for a Super Fan! – Fans finally got the sequel they were longing for this year and Chrysa of Thrifty Jinxy is here to help you pick out an incredible gift for the Incredibles fan in your life. 35 Chewbacca Gifts for the–Rawwwwr! Wait a sec, she said don’t buy gift cards?! Well, I kind of did. I said don’t default to gift cards. I want to give you all the options and one of them is giving you a list of useful gift cards to get for geeks rather than just getting them an Amazon one or a general shopping one like Love2shop. 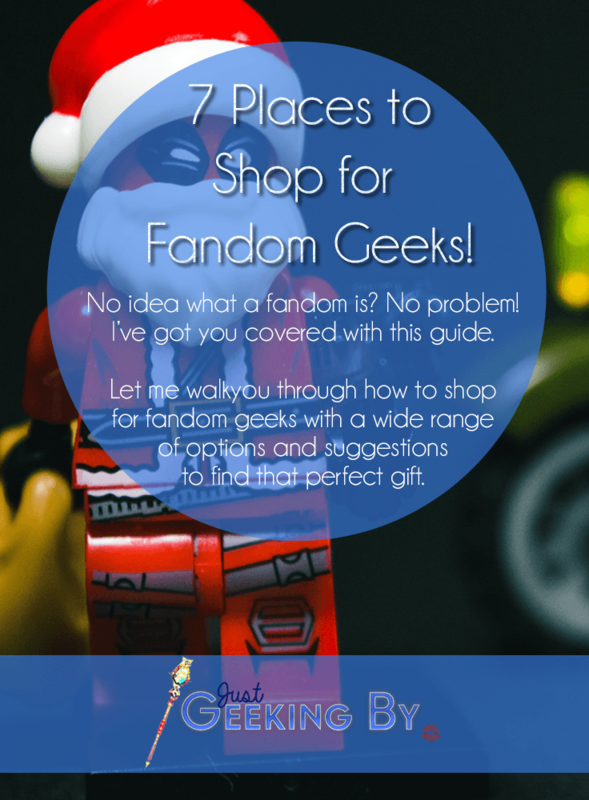 If you’re still well and truly stuck for ideas for the fandom geek in your life or want some advice then let me know! Either leave me a comment or drop me message on Facebook or Twitter and I’ll get back to you within 24 hours. Previous Post: Introducing The Ultimate Gift Guides for the Geek in your Life! Next Post: Incredible Gift Ideas for Gamer Geeks!